That image above isnt a rather crude attempt at a connect-the-dots puzzle. No, its actually an image of the early universe containing supermassive black holes and galaxies from early in the distant cosmos. The amazing image was snapped by NASAs Chandra X-ray Observatory, which looked at the same portion of the sky for 11 and a half weeks (or 7 million seconds). Its the deepest X-ray image of the universe ever taken. The research was led by Pennsylvania State University, and presented this week at the 229th meeting of the American Astronomical Society in Texas. A paper detailing the findings was published in the Monthly Notices of the Royal Astronomical Society. Each dot is a large cosmic source of X-rays up to 13 billion light-years away, either a galaxy or a supermassive black hole. More than 70 percent of the objects are the latter, ranging in mass from 100,000 to 10 billion times the mass of our Sun. Scientists are hoping to use the data to peer into theearly universe, with many of these black holes growing just one or two billion years after the Big Bang in bursts of activity, rather than slowly gathering up matter. 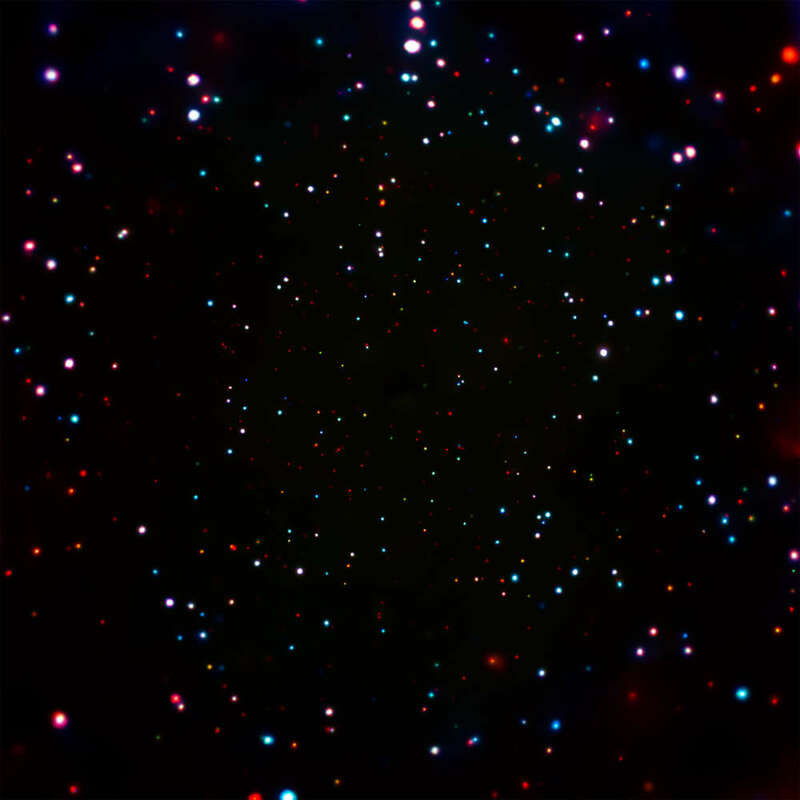 “With this one amazing picture, we can explore the earliest days of black holes in the Universe and see how they change over billions of years,” Niel Brandt of Pennsylvania State University said in a statement. The entire image is part of the Chandra Deep Field-South, a section of the sky devoid of clouds of gas from our galaxy, allowing astronomers an unobstructed view into the distant universe. It is located towards the constellation of Fornax in the Southern sky. The reason the black holes shine so brightly in X-rays is because they heat up gas falling towards their event horizon, the point at which nothing not even light can escape the singularitys pull at the center of the black hole. Interestingly, this research may point towards supermassive black holes having heavier beginnings than thought, with their seeds having a mass of about 10,000 to 100,000 times the mass of the Sun. This would better account for how they grow to a billion times the mass of the Sun, rather than a competing light theory, which posits they begin just 100 times the Suns mass, and thus having a growth rate that contradicts our current models. Here’s the image again in full for you to enjoy.